Recently, users in PLAYERUNKNOWN’S BATTLEGROUNDS have been experiencing a problem with textures not rendering properly. While there are many factors that can contribute to a slow render, the general consensus seems to be that no matter what the cause, the rendering issues have gotten worse with the most recent patch — with the most common complaint being bad render times on buildings after players parachute to the PUBG battleground. This is detrimental to a game that involves going in buildings and looting them — because if the textures don’t load, it makes it very difficult to get inside and interact with objects. This rendering glitch can be a game-breaking bug, and unfortunately a lot of the fixes subtly imply that you might have to upgrade your computer to handle the demands of the game. But depending on how much power your rig is packing and how often the render issues occur, some other fixes might work for you. So in this guide, we’re going to go over all the options and workarounds the PUBG community has found thus far. This is one of the easiest fixes for people with a Nvidia Graphics card. All you have to do is turn off Shadowplay. 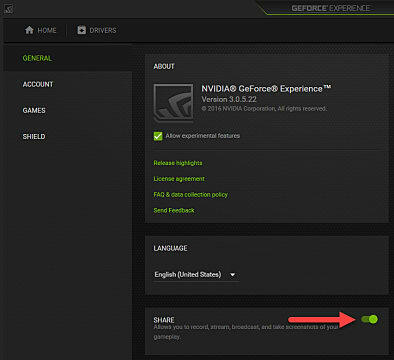 To do this, simply open your GeForce General Settings menu and turn off the Share option. A slow render time can be caused by the slow transfer of game files from hard drive to RAM. One way to get the files quickly to RAM is by booting them from a Solid State Drive (SSD) instead. So you’ll want to transfer the game folder onto your SSD. If you don’t have space on your SSD, you can just transfer over the pagefile (virtual memory) and it should render quicker. This will get you into the game’s folder. Then you just drag and drop it into your SSD’s Steam folder. In the Settings menu, go to Downloads and find Content Libraries (at the top). Right click on the game and click Backup Game Files. Choose a destination for the backup to go and let the program run. Once complete, you’ll want to restore the backup by going to Steam and clicking on Backup and Restore games. In this file, find ViewDistanceQuality=1. Change the 1 to a 2 and save. Then reboot the game and see if it works better. This trick involves forcing the game to render most of its assets before you hit the ground from parachuting. After you drop out of the plane and aim yourself where you want to go (hold W through the entire thing), hit TAB once your parachute auto-deploys.The game should freeze for a while, but it will come back with all the buildings loaded. None of these fixes are guaranteed to work or completely solve your rendering woes, but at least one of them should let you work around the problem while the developers get the game in working order. The game is still in Early Access and is getting closer to their full launch, but for now we’re just going to have to tough it out.